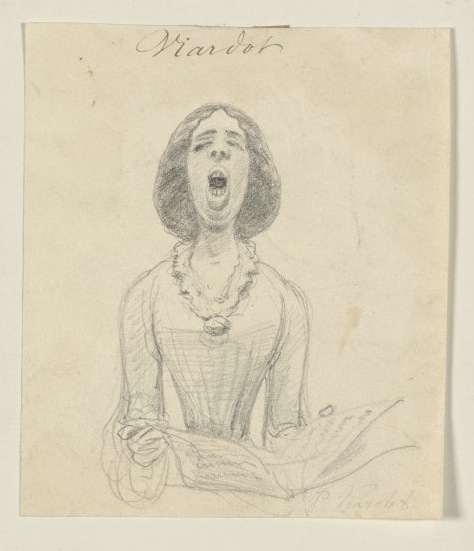 Who drew this portrait of the great mezzo-soprano Pauline Viardot-García that I unearthed from the New York Public Library's digital database? The signature (a faint "P. Viardot" and on the bottom right) suggests Viardot's son Paul, who insisted as an adult that his father was none other than Ivan Turgenev (his sisters did not agree). It may also have been drawn by Pauline herself who was known to draw. There is something funny and disturbing about it. Disturbing, if you entertain the idea that Viardot actually sang with teeth bared, head back and eyes nearly closed. Funny, if you see this up the nostrils view as caricature. I'm choosing the latter. There is one other possibility worth mentioning however, which is that Viardot made this drawing herself. It seems she was something of a prankster, or so I have read in Michael Steen's The Enchantress of Nations: Pauline Viardot: Soprano, Muse, Lover.